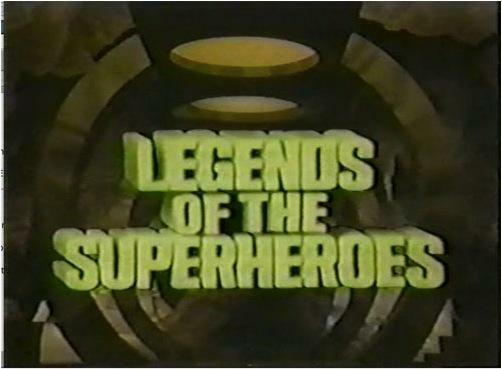 If you are a Batman fan like me, you probably have a bootleg copy the 1979 super campy Super Hero specials "Legends of the Super Heroes: The Challenge" and "Legends of the Super Heroes: The Roast." I don't know about you, but my copies aren't the greatest. But help is coming...On October 19 the live "somewhat" version of the Super Friends is officially released on DVD. Heroes and villains of DC Comics square off in the two-part, live action, made-for-TV (with a laugh track!) smackdowns of Legends of the Super Heroes. 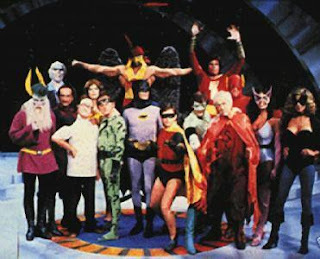 The Challenge: Batman and Robin (Adam West and Burt Ward of the live-action Batman TV series) lead The Flash, Green Lantern and more JLA members against The Riddler (Frank Gorshin reprising his TV role), Mordu, Weather Wizard and other Doom-dealers. The Legion's ultimate gambit: trick the heroes into downing a diabolical depowering drink! The Roast: Poking fun beats swapping punches when celebrity host Ed McMahon emcees a rowdy rave-up. Who knew DC Super Heroes and villains packed as much verbal wit as physical grit when not locked in combat? These Legends will leave you laughing. The DVD is going to be sold exclusively at WBShop.com and $19.95 for the 100 minute disc. Pre-order legends of the Super Heroes today. I still have the bootleg as well, but I'm about to trade up! Me too. I forgot to mention that the DVD will also include newly found out takes. Should be fun.